Retro AMERICAN TOURISTER Suitcase Jetsetter's Luggage Worldwide Travel Stickers vintage 1950's made in USA in very good vintage condition. 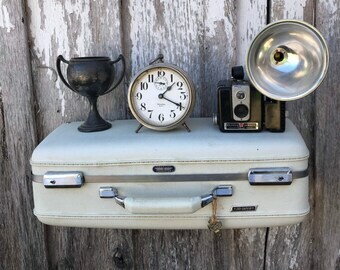 Vintage Retro Travel Case Costume Case The Orchid Diane Studio of the Dance Rustic Home Decor vintage 1960's in excellent vintage condition. 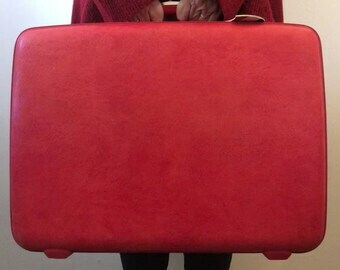 Vintage Red American Tourister Suitcase WITH KEY. Luggage Tag, 24"
Vintage American Tourister Suitcase, Blue, Hard Sided, FREE SHIPPING!! Luggage Die Cuts, Luggage Confetti, Suitcase with Travel Stickers Die Cuts, Vintage Suitcase Die Cuts, Vintage Suitcase Confetti, 16 Ct.